Erica Abi Wright a.ka. Oblongata Cerebellum, MC Apple, Lowdown Loretta Brown, Analog Girl in a Digital World, Annie the Alchemist, Fat Belly Bella. This lil' Badu mixtape put together by DJ Rahdu over at BamaLoveSoul.com got as many styles as the woman got aliases. 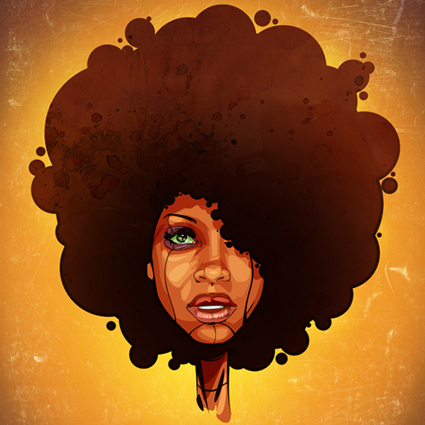 Rahdu's idea was to give tribute to Erykah by compiling some of the best remixes, covers and flips of her tunes. Ace! "It’s no surprise that this Southern Girl has continued to mystify and amaze us 15 years after the release of her genre busting debut album Baduizm. Not only is she unique, she has continued to push the boundaries on each of her subsequent releases. Closely aligned, it seems, with every musician that matters (she was a core member of the Soulquarians for crying out loud!) she’s always able to create songs that either confirm or confound your musical sensibilities. For this reason, amongst many others, we love the Analogue Girl! Alas, there are those that feel they can perfect what Badu has done in the studio or just want to add their personal spin to her musical offerings, heck, some have even been commisioned; It’s these remixes, flips and covers that fuel this mix. Y’all Feel That is a collection of some of our favorite tricked out treats, lovingly mixed and offered to you and your mp3 players. Enjoy!"